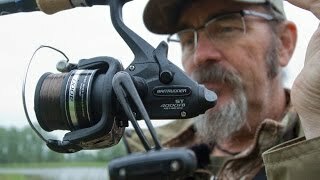 The Shimano Baitrunner STFB Spinning Fishing Reels are as feature packed as you would expect from a reel with the celebrated Shimano reputation to back it up. Kicking it off with a classic black XT7 spool with an attractive silver finish, these reels have been designed to tackle anything from bream and whiting up to Jew and inshore snapper. Some of the features these spinning reels boasts include the new Varispeed Oscillation system which helps improve line lay, as well as a power roller. The baitrunner STFB reels come in two sizes, the 2500 size has a 5.2:1 gear ratio and a 3kg drag capability and the 4000 size has a 5.1:1 gear ratio with a 6kg max drag. Both reels come with 1+1 bearings and Shimano's 10 year manufacturers warranty so you know your reels quality is assured. And don't forget we do FREE shipping for Dinga Club members!